The ease of combination ("combinability", or "burnability") is about how easily the raw materials react with each other in the kiln to produce the clinker minerals. Clinker composition is evidently one of the key factors which determine cement quality. Composition is controlled mainly by suitable blending of raw materials, but there are limitations to what can be achieved. Before considering these limitations, a summary of the clinkering process, and of the role of the liquid phase, may be useful. The essential reactions in making Portland cement are the calcination of limestone to produce lime (calcium oxide) and the combination of this lime with silica to make belite and, especially, alite. During clinkering, the clinker contains solid phases and a liquid phase. The bulk of the clinker remains as a solid. At the highest temperatures reached by the clinker, perhaps only about 25% of the clinker is a liquid and the solid phases are then mainly alite, belite and free lime. The liquid is vital in that it acts a flux, promoting reactions by ion transfer; without the liquid phase, combinability would be poor and it would be very difficult to make cement. The liquid phase is composed largely of oxides of calcium, iron and aluminium, with some silicon and other minor elements. As the clinker leaves the kiln and cools, crystals of aluminate and ferrite form from the liquid. The fineness of the raw materials - fine material will evidently react more readily than will coarser material, so finer material makes for better combinability. Lime Saturation Factor - higher LSF mixes are more difficult to combine than are lower LSF mixes, so a higher LSF makes for poorer combinability. Silica Ratio - mixes of higher SR are more difficult to combine because there is less liquid flux present, so a higher SR makes for poorer combinability. Alumina Ratio - mixes of AR approximately equal to 1.4 will be easier to burn than if the AR is higher or lower. This is because at an AR of about 1.4, there is more clinker liquid at a lower temperature and combinability is optimised. (Minor constituents such as MgO can alter this optimum AR). The intrinsic reactivity of the raw materials - some types of silica, for example, will react more easily than will others. Ideally, a cement producer would like to control all three clinker compositional parameters, LSF, SR and AR. That would define the approximate proportions of the four main minerals in the clinker. Suppose the cement producer has a source of limestone and a source of clay and that he knows the chemical composition of each. He can blend the limestone and clay in the correct proportions to give whatever value for LSF he likes, say 98%. However, the SR and AR will then be fixed by whatever the composition of the raw materials determines them to be. Although there will probably be some SiO2, Al2O3 and Fe2O3 in the limestone, these oxides will be mainly contributed by the clay. In this example, therefore, it is the clay composition which will largely determine SR and AR. In general terms, two types of raw material, such as limestone and clay, can be proportioned to fix any one parameter only, say the LSF. To fix x parameters, x+1 materials of suitable composition are needed, so to control all three parameters, LSF, SR and AR, a cement works needs to blend four different materials of suitable composition. On a coal-fired works, the composition of the coal ash also needs to be allowed for, since the ash falls onto the part-reacted feed and combines with it. In practice, a works may have 5 or 6 raw materials in order to control composition. Alite is the clinker mineral that contributes most to strength in concrete, especially earlier strengths. Therefore, where high early strengths are important, the cement producer may want to maximise the alite content; it might appear logical that he would want all the silicates to be present as alite, with no belite present in the clinker. This may be so but often it isn't quite that simple. For a given mix, there will be an optimum burning regime. Under-burning will not combine most of the lime to make alite. However, over-burned clinker is likely to contain silicates that are less hydraulically reactive - they react more slowly with water. Harder burning, at a higher temperature or a longer period of time or both, may therefore combine more free lime but at the expense of silicate reactivity. If the manufacturer tries to increase the alite content too far, he may produce a clinker that has more alite, but less-reactive alite. Overall, the clinker may produce better strengths with a slightly lower proportion of more reactive alite. Where coal is the fuel for the kiln, the raw mix composition has also to take into account the effect of coal ash, as much of the ash will become incorporated into the clinker. The quantity of ash is enough to have a significant effect on clinker composition - ash may represent perhaps 2%-3%, or more, of the clinker. Articles like this one can provide a lot of useful material. However, reading an article or two is perhaps not the best way to get a clear picture of a complex process like cement production. 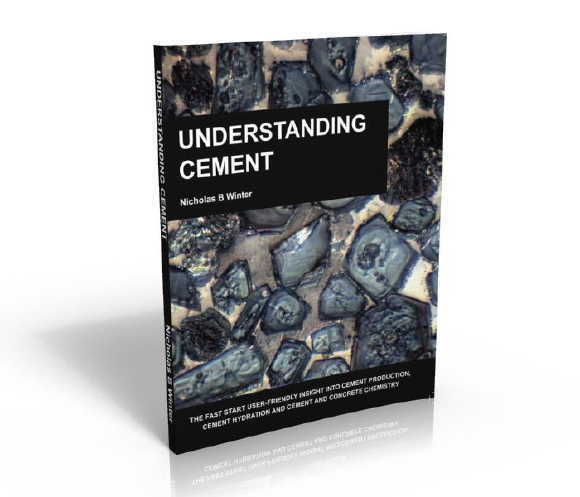 To get a more complete and integrated understanding of how cement is made, do have a look at the Understanding Cement book or ebook. This easy-to-read and concise book also contains much more detail on concrete chemistry and deleterious processes in concrete compared with the website. An over-the-shoulder look at ASR in concrete as seen using the SEM. The UC review of "Alkali-Aggregate Reaction in Concrete: A World Review" edited by Iam Sims and Alan Poole. Almost everyone interested in cement is also concerned to at least some degree with concrete strength. This ebook describes ten cement-related characteristics of concrete that can potentially cause strengths to be lower than expected. Get the ebook FREE when you sign up to CEMBYTES, our Understanding Cement Newsletter - just click on the ebook image above. Copyright Notice: material on this website is copyright © 2005-2019 by WHD Microanalysis Consultants Ltd. All rights reserved.